Click the link to download the form!! Okay, it’s time to put your sports brains on and come have a go at our new fundraiser that will need some serious research. 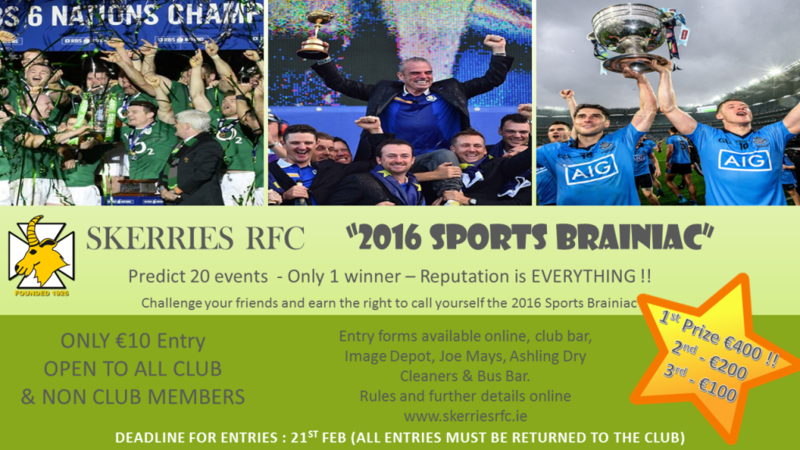 A Leader Board of the top 100 will be updated monthly on the Skerries RFC website (www.skerriesrfc.ie) and on our Facebook page. All entries will be acknowledged by email. The judges’ decision is final on all matters regarding the competition. The person with highest points total after the last event has finished will be declared the winner. All entries and fees must be received by Sunday 21st February to Skerries Rugby Club, Holmpatrick, Skerries Co. Dublin or dropped into the Club post box on the blue door nearest the road. If your selection does not participate in the event you will not be awarded any points. In the event of a tie between persons on equal points, the person with the closest answer on the Tie Breaker question will be the winner. If there is still a tie after the Tie Breaker the prize money for finishing in that position will be equally divided between all persons with equal Tie-Break answers. Points awarded for correct answers are the same for all events, except where otherwise noted on the official entry form.